bitZino, which was founded in June 2012, is an HTML5 casino that offers players a nice simple way to wager Bitcoin on some of the most popular casino style games, on the market today. bitZino has been around through the ups and downs of Bitcoin, but still offers players the opportunity to wager some of the highest limits that will be found at any Bitcoin casino today. The foundation Bitzino was set upon was the simple idea that players needed a place to play the most popular games, be able to wager with higher limits, and offer tremendous support and reliability for the Bitcoin gaming community. Since its introduction to the market, bitZino has not failed in any of these expectations they initially set for themselves and have continued to be a desired destination for high rollers, but also cater to bankrolls of any size. While bitZino does not have a mass amount of games, the games that they do have are what most players are seeking when they are finding a Bitcoin casino to play at. The owners of bitZino have prioritized the most popular games and built the site around those games. Each game that is featured on bitZino offers a very smooth game play, due to the fact that every game that they offer, is provided in an HTML5 format. This means that players on every different type of platform are able to partake in the bitZino experience and rarely ever requires any maintenance to the games that other casinos using third-party software, might encounter. As mentioned above, bitZino provides the following games: Blackjack, Craps, Roulette, Slots, Three Card Poker, and different variations of video poker. What is extremely unique to the bitZino casino are the extremely high limits that they are able to provide players that have bigger bankrolls. Most games that have even payouts, such as blackjack and roulette, have max bets all the way up to 25 Bitcoin, which by far is the highest that any reliable Bitcoin casino offers, with today’s value of Bitcoin. The slots, video poker, and craps do have slightly lower limits then the blackjack and roulette, only due to the fact that the payouts are more tiered, as they would be in a regular casino. The max a player can win on one roll or spin on bitZino is a remarkable 160 Bitcoin on video poker on a max bet of two Bitcoins, if the player is lucky enough to hit a royal flush. Each game that is on bitZino has a very pleasing display to it, but is laid out in a simple design. Although the design itself is not worthy of any graphic design awards, by any means, bitZino has proven that the simplest of designs are some of the more effective ways of providing players a fun and non-complicated way to wager Bitcoin. The fact bitZino has players who have given such high remarks and compliments, further proves that with a combination of popular games, a wide range of limits for all sizes of bankrolls, and a simple layout is all it takes to be one of the most respected Bitcoin casinos within the Bitcoin gaming community for nearly three years. Banking at bitZino is a seamless and as easy as it is to play there. Deposits take only one confirmation to confirm and be credited to an account. Withdrawals are nearly instant once a request has been submitted, unless it is an extremely high amount, in which case will be processed usually within the hour. Support at bitZino is as excellent as any other part of the site, due in large part to the time it takes to respond to an issue even though the support team itself, is actually quite small in numbers. Average responses usually only take a few hours to respond to and are always handled in a professional manner and with a “player-first” mindset. All games at bitZino are handled with the “Provably Fair” verification, and can be checked by both the player and the site to check to see if the resolving of the bet is truly fair. This is the Bitcoin gaming standard of sites set up in an HTML5 style. 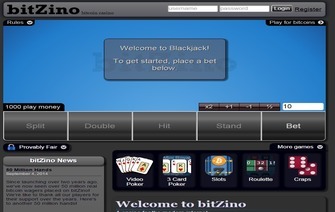 For players that hit the main casino games like Blackjack, Roulette, and the other games that have been mentioned throughout this review, bitZino is one of the few choices that seem to reach out to all players of all levels and bankrolls. Besides the fact that they are easily the best choice when it comes to higher limits, they are also a great choice when it comes to the seamless game play that all their games provide, since they are set up in an HTML5 format. The support, even though it comes from a small number of support team members, feels like it comes from bigger casino support team than is actually there. As banking is set up in a way that is a Bitcoin gaming industry standard of only needing one confirmation for funds to be credited, the only negative to bitZino is that they do not provide a player loyalty program or any type of bonus. We think that can be overlooked, just for the mere fact that bitZino blasts other casinos out of the water with the high limits they set. New players will find bitZino as one of their desired places to play. Bonus bitZino casino does not offer a sign-up bonus at the moment.